Volcano is a 1997 American disaster film directed by Mick Jackson and produced by Andrew Z. Davis, Neal H. Moritz and Lauren Shuler Donner. The storyline was conceived from a screenplay written by Jerome Armstrong and Billy Ray. The film features Tommy Lee Jones, Anne Heche, and Don Cheadle. Jones is cast as the head of the Los Angeles County Office of Emergency Management (LAC OEM), which has complete authority in the event of an emergency or natural disaster. His character attempts to divert the path of a dangerous lava flow through the streets of Los Angeles following the formation of a volcano at the La Brea Tar Pits. A joint collective effort to commit to the film's production was made by the film studios of 20th Century Fox, Moritz Original and Shuler Donner/Donner Productions. It was commercially distributed by 20th Century Fox. Volcano explores civil viewpoints, such as awareness, evacuation and crisis prevention. Although the film used extensive special effects, it failed to receive any award nominations from mainstream motion picture organizations for its production merits. Volcano premiered in theaters nationwide in the United States on April 25, 1997 grossing $49,323,468 in domestic ticket receipts, on a $90 million budget. It earned an additional $73.5 million in business through international release to top out at a combined $122,823,468 in gross revenue. Despite its release and recognition, Dante's Peak (which was released 2 months before) gained more commercial success than Volcano. It was also met with mixed critical reviews before its initial screening in cinemas. The Region 1 code widescreen edition of the film featuring special features was released on DVD in the United States on March 9, 1999. In downtown Los Angeles, an earthquake strikes. Michael 'Mike' Roark, the head of the city's Office of Emergency Management or OEM, insists on coming to work to help out with the crisis, although he has been on vacation with his daughter Kelly. His associate, Emmit Reese, notes that the quake caused no major damage, but seven utility workers are later burned to death in a storm drain at MacArthur Park. One escapes and survives, but is severely burned on one side of his face. As a precaution, Roark tries to halt the subway lines that run parallel to where the deaths took place, but Los Angeles MTA Chairman Stan Olber mulishly opposes, feeling that there is no threat to the trains. Against regulations, Roark and his coworker Gator Harris venture down the storm sewer in the park to investigate. They are nearly burned alive and barely escape when hot gases suddenly spew out of a crack in the concrete lining and flood the tunnel. Geologist Dr. Amy Barnes believes that a volcano may be forming beneath the city with magma flowing underground. Unfortunately, she has insufficient evidence to make Roark take action. The next morning, at around 5:15 A.M., Barnes, and her assistant Rachel, venture in the storm sewer to investigate the scene of the incident. They discover the crack in the ground that released the gases earlier. While taking samples, a more powerful earthquake strikes, and Rachel is killed when she falls into the crack that is later engulfed by a rush of the hot gases, while a subway train derails underground and power is knocked out across the city. Minutes later, steam explodes from the sewer system, and in the La Brea Tar Pits, volcanic smoke and ash billows out, followed by high velocity lava bombs that burst out of the tar pits, which ignites several buildings. Roark helps injured firefighters out of the area. Moments later, a newly formed volcano erupts from the tar pits, and lava begins to flow freely down Wilshire Boulevard, incinerating everything in its path, including Roark's GMC Suburban, and an LAFD fire truck downed by a lava bomb, killing two firefighters inside. Roark and his daughter become separated as she is injured when a nearby lava bomb sputters and burns her leg, and she is taken to Cedars-Sinai Medical Center by Dr. Jaye Calder. A few minutes later, while in the Red line metro tunnel, the passengers in the derailed subway train are exposed to severe heat and toxic gases, which causes them all to eventually lose consciousness. The conductor tries but fails to open the doors along the length of the train, until reaching the rear where he sees the incoming lava flow in the tunnel hundreds of meters away. Meanwhile, Olber leads his team through the tunnel to the derailed train, searching for survivors. They manage to save everyone, but Olber notices that the train driver is still missing and goes back; he finds the driver alive but unconscious, just as the lava reaches the train and begins to flow underneath it. Knowing that the train is melting, Olber sacrifices his life to save the driver by jumping into the lava flow, throwing the driver to safety. Roark, Barnes, and police lieutenant Ed Fox devise a plan to stack concrete barriers at the intersection of Wilshire Boulevard and Fairfax Avenue, creating a cul-de-sac to pool the lava as helicopters dump water on it to form a crust, making the operation a success. Barnes later theorizes that the magma is still flowing underground through the Red Line subway extension, and calculates that the main eruption will occur at the end of the line at the Beverly Center near Cedars-Sinai. To prove this, Barnes and Roark lower a video camera into the tunnel to watch it, only for the camera to be incinerated by a fast-moving flow of lava. They calculate the speed and realize that they have 30 minutes until the lava hits the end of the Red Line. Through Roark's direction, explosives are used to create channels in the street to divert the flow of lava into Ballona Creek, which will later flow into the Pacific Ocean, but Barnes realizes that the street is sloping in the opposite direction and instead the lava would flow directly towards the injured patients, much to the displeasure of Roark and Fox. Roark devises another plan to demolish a 22 story condominium building to block the lava's path from flowing towards the medical area and the rest of the Los Angeles West Side. Gator refuses to abandon an LAPD SWAT cop, who has gotten trapped under a core column while slotting explosive charges. At that point the lava reaches the dead end of the Subway tunnel extension, and explodes out of the ground in a massive geyser. Gator and the officer sacrifice their lives to detonate the final explosive charge. Roark then spots Kelly nearby, trying to retrieve a small boy who wandered off, putting them in the direct path of the collapsing building. Roark barely manages to save both of them from being crushed as the building collapses. The plan is successful, and the lava flows directly to the ocean. Roark escapes from the wreckage with Kelly and the young child still alive. The death toll is nearly a hundred people, thousands injured, and damages in billions. It starts to rain, with surviving civilians having a sigh a relief. Reese shows up with the family dog Max, along with a call from the Chief of the Los Angeles Police Department on how to rebuild the city. Roark tells Reese that he is on vacation after all, and to tell the chief that too, as he goes home with Kelly while Reese takes over to handle the situation. The film ends with an epilogue displaying a graphic stating that the volcano, named "Mount Wilshire", is still in an active state. Filming was shot primarily on location in Los Angeles, California. Various filming sites included MacArthur Park, Cedars-Sinai Medical Center and the La Brea Tar Pits. Extensive special effects surrounding certain aspects of the film such as the lava flow, were created by ten separate digital effects companies including VIFX, Digital Magic Company, Light Matters Inc., Pixel Envy and Anatomorphex. An 80% full-size replica of Wilshire Boulevard, which was one of the largest sets ever constructed in the United States, was assembled in Torrance, California. The computer-generated imagery was coordinated and supervised by Dale Ettema and Mat Beck. Between visuals, miniatures, and animation, over 300 technicians were involved in the production aspects of the special effects. The score for the film was originally composed and orchestrated by musical conductor Alan Silvestri. Recording artists James Newton Howard and Dillinger among others, contributed songs to the music listing. The audio soundtrack in Compact Disc format featuring 8 tracks, was officially released by the American recording label Varèse Sarabande on April 22, 1997. The sound effects in the film were supervised by Christopher Boyes. The mixing of the sound elements were orchestrated by Jim Tanenbaum and Dennis Sands. Among mainstream critics in the US, the film received generally mixed reviews. Rotten Tomatoes reports that 50% of 46 sampled critics gave the film a positive review, with an average score of 5.1 out of 10. 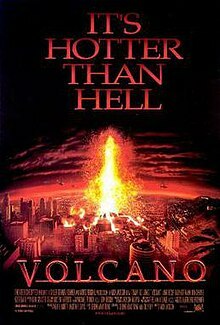 The website's critical consensus reads, "Volcano's prodigious pyrotechnics and Tommy Lee Jones' crotchety sneers at lava aren't quite enough to save this routine disaster film." At Metacritic, which assigns a weighted average using critical reviews, the film received a score of 55 out of 100 based on 22 reviews, indicating "mixed or average reviews". Audiences polled by CinemaScore gave the film an average grade of "B+" on an A+ to F scale. In 1997, the film was nominated for a Golden Raspberry Award in the category of "Worst Reckless Disregard for Human Life and Public Property", but lost to Con Air. "The ads say The Coast Is Toast, but maybe they should say The Volcano Is Drano. This is a surprisingly cheesy disaster epic. It's said that Volcano cost a lot more than Dante's Peak, a competing volcano movie released two months ago, but it doesn't look it. Dante's Peak had better special effects, a more entertaining story, and a real mountain." Janet Maslin wrote in The New York Times, "Volcano begins so excitably and hurtles so quickly into fiery pandemonium," but noted that "in the disaster realm, it's not easy to have it all. A film this technically clever can't get away with patronizing and familiar genre cliches." Roger Ebert in the Chicago Sun-Times called it a "surprisingly cheesy disaster epic" while musing, "The lava keeps flowing for much of the movie, never looking convincing. I loved it when the firemen aimed their hoses way offscreen into the middle of the lava flow, instead of maybe aiming them at the leading edge of the lava—which they couldn't do, because the lava was a visual effect, and not really there." In the San Francisco Chronicle, Mick LaSalle wrote that "Things go bad after Volcano plays its last card — the lava — and from there it has nothing to show but more of the same. A host of characters is introduced in the opening scenes, but Volcano doesn't know what to do with them. It can't make us care." Owen Gleiberman of Entertainment Weekly said, "Volcano is cheese, all right, but it's tangy cheese. I'm not sure I've ever seen a disaster movie in which special effects this realistic and accomplished were put to the service of a premise this outlandish." He declared: "Volcano is jittery in a clinical, self-important way." Walter Addiego of the San Francisco Examiner, felt "Volcano offers a bit of humor, a minimum of plot distraction and the joys of watching molten rock ooze down Wilshire Boulevard." Left equally impressed was James Berardinelli of ReelViews. Commenting on the character significance of Mike Roark, played by Jones, he said it was "a wonderfully heroic figure — a man of action who never has time to rest. The fate of the city rests on his shoulders, and he knows it. Jones' fierce, unflagging portrayal helps us accept Roark not only as the man to save L.A., but as a loving father who is more concerned about his daughter's safety than that of every other citizen." In his summation, he wrote, "Volcano has opened the "summer" movie season at an astoundingly early late-April date. But there's no mistaking this as anything but a blockbuster trying to get a running jump on competition like The Fifth Element and The Lost World. This isn't the kind of film where it's worth waiting for the video tape — it's too big and brash, and demands the speakers and atmosphere of a state-of-the-art theater." Kenneth Turan of the Los Angeles Times added to the positive sentiment by saying the film "glows with heat. Lava heat. The coast may be toast, but it's the lava, covering everything like a malevolent tide of melted butter, that makes this a disaster picture that's tastier than usual." Writing for Time Out, author TCh said, "The most striking aspect of this fun, old-fashioned disaster movie is the novelty of seeing the most familiar of backdrops used as a creative resource in its own right." He commended how "Jones and Heche work hard to dig up an emotional rapport from next to nothing" while also praising how the "slow but inexorable progress of the lava makes for more suspense than the usual slam bang firework display." Not entirely impressed was Margaret McGurk writing for The Cincinnati Enquirer. She called the film "depreciating entertainment value of the natural-disaster trend" while also mentioning how the "High-caliber special effects are still fun, but all this lock-step storytelling is wearing thin." But in a hint of commendation, McGurk thought "on its own escapist terms, Volcano dishes up a textbook serving of low-I.Q., high-energy entertainment." Describing a comical position on seismic activity, Marc Savlov of The Austin Chronicle said Volcano was a "laughably ridiculous take on what we all secretly dream of: Los Angeles, washed away in a huge, molten tide of cheese — uh, lava, I mean." Savlov added, "Screenwriters Jerome Armstrong and Billy Ray have crammed the script with topical references to the L.A. riots, Rodney King, racial inequality, sexism, the ineffectuality of the 911 system, and reams of very, very bad dialogue. So bad, in fact, that the screening audience I viewed Volcano with seemed to enjoy it immensely, hooting and hollering and laughing as though it were an old episode of Mystery Science Theater 3000." "director Jackson and his crew (who made good use of hand-held and Steadicam shots and reportedly averaged an impressive 30 to 40 camera setups a day) move so quickly from shot to shot and location to location that viewers have a limited time to dwell on the film's predictable implausibilities." Rita Kempley of The Washington Post, openly wondered why "there's no volcano in "Volcano"?...The hokey disaster drama features towering plumes of smoke, a splendid display of fireworks and brimstone, and rivers of molten magma, but I'll be darned if there's a burning mountain." She concluded her review by declaring that "While disaster yarns aren't known for subtlety, there are limits, and Volcano giddily goes beyond them. Director Mick Jackson, who also made Steve Martin's wry "L.A. Story," must have had his hands full with the logistics of this bombastic extravaganza. He sets a blistering pace, but the movie never generates any real thrills." Todd McCarthy of Variety was more positive, writing Volcano delivered "enough spectacular action to get it off to a hot B.O. start" and that "first-time screenwriters Jerome Armstrong and Billy Ray waste no time with exposition or scene-setting, starting the fireworks with a nerve-jangling morning earthquake that puts city workers on alert for possible damage." Volcano premiered in cinemas on April 25, 1997. At its widest distribution in the United States, the film was screened at 2,777 theaters. The film grossed $14,581,740 in box office business in Canada and the United States on its opening weekend, averaging $5,256 in revenue per theater. During that first weekend in release, the film opened in first place beating out the films Romy & Michelle's High School Reunion and Anaconda. The film's revenue dropped by 37% in its second week of release, earning $9,099,743. In the month of June during its final weekend showing in theaters, the film came out in 12th place grossing $602,076. The film went on to top out in the United States and Canada at $49,323,468 in total ticket sales through a 7-week theatrical run. In other markets, the film took in an additional $73,500,000 in box office business for an international total of $122,800,000. For 1997 as a whole, the film would cumulatively rank at a box office performance position of 39. Following its cinematic release in theaters, the film was released in VHS video format on May 26, 1998. The Region 1 Code widescreen edition of the film was released on DVD in the United States on March 9, 1999. Special features for the DVD include interactive menus, scene selection and the original theatrical trailer. It is not enhanced for widescreen televisions. The film was released on Blu-ray Disc on October 1, 2013 by Starz/Anchor Bay. ^ a b "Volcano". Box Office Mojo. Retrieved July 14, 2010. ^ a b Jackson, Mick (Director). (1997). Volcano [Motion picture]. United States: 20th Century Fox. ^ "Volcano (1997)" – via www.imdb.com. ^ a b c "Volcano DVD". 20th Century Fox. March 9, 1999. Retrieved July 14, 2010. ^ a b c d "Volcano (1997) Cast and Credits". Yahoo! Movies. Retrieved July 14, 2010. ^ a b McCarthy, Todd (April 27, 1997). Volcano. Variety. Retrieved July 14, 2010. ^ "Volcano - Production Credits". The New York Times. Retrieved July 14, 2010. ^ "Volcano: Original Motion Picture Soundtrack". Amazon.com. Retrieved July 14, 2010. ^ a b "Volcano Reviews". Metacritic. CBS Interactive. Retrieved February 27, 2018. ^ "Volcano (1997)". Rotten Tomatoes. Fandango Media. Retrieved February 27, 2018. ^ Wilson, John (August 23, 2000). "1997 Archive". Golden Raspberry Award. Retrieved May 17, 2009. ^ a b Ebert, Roger (April 25, 1997). Volcano. Chicago Sun-Times. Retrieved July 14, 2010. ^ Maslin, Janet (April 25, 1997). Volcano (1997) Very Mean Streets: They're Full of Lava. The New York Times. Retrieved July 14, 2010. ^ Lasalle, Mick (October 3, 1997). 'Volcano' Sizzles but Quickly Loses Steam. San Francisco Chronicle. Retrieved July 14, 2010. ^ Gleiberman, Owen (May 2, 1997). Volcano. Entertainment Weekly. Retrieved July 14, 2010. ^ Addiego, Walter (April 25, 1997). Lavapalooza!. San Francisco Examiner. Retrieved July 14, 2010. ^ Berardinelli, James (April 1997). Volcano. ReelViews. Retrieved July 14, 2010. ^ a b Turan, Kenneth (April 25, 1997). Volcano - Go With the Flow. Los Angeles Times. Retrieved July 14, 2010. ^ a b TCh (April 1997). Volcano (1997). Time Out. Retrieved July 14, 2010. ^ a b McGurk, Margaret (November 1997). 'Volcano' more of a blast than 'Dante's Peak'. The Cincinnati Enquirer. Retrieved July 14, 2010. ^ a b Savlov, Marc (April 25, 1997). Volcano. The Austin Chronicle. Retrieved July 14, 2010. ^ a b Kempley Rita, (April 25, 1997). 'Volcano': 1 on the Richter Scale. The Washington Post. Retrieved July 14, 2010. ^ "Weekend Box Office April 25–27, 1997". Box Office Mojo. Retrieved July 14, 2010. ^ "Weekend Box Office May 2–4, 1997". Box Office Mojo. Retrieved July 14, 2010. ^ "Weekend Box Office June 6–8, 1997". Box Office Mojo. Retrieved July 14, 2010. ^ "Volcano Domestic Total Gross". Box Office Mojo. Retrieved July 14, 2010. ^ "1997 Domestic Grosses". Box Office Mojo. Retrieved July 23, 2016. ^ "Volcano VHS Format". Amazon.com. Retrieved July 14, 2010. ^ "Volcano Widescreen DVD". Barnes & Noble. Retrieved July 14, 2010.